The Jacaranda is a tall, forest tree reaching 45 m in height, extending into the canopy of humid lowland rainforests. It is best known for its spectacular purple flowers that bloom in March & April. Its trunk has gray to yellowish bark with narrow vertical fissures, and the base of the trunk has small buttresses with horizontal wrinkles resembling an elephant’s trunk, giving it one of its local names, “elephant foot.” Leaves are large and opposite in arrangement, and bipinnately compound with leaflets and subleaflets. Small, deep-purple tubular flowers grow in dense clusters, and are visible in the forest canopy at great distances, even on satellite images! When the flowers drop, the forest floor is covered in a purple blanket. Seeds form after the flowers drop in a hard, oval capsule, green then turning woody when mature, with a longitudinal row containing small seeds. Seeds mature in July and August. Young trees grow fast and are generally not branched. Due to its beautiful display when flowering, Jacarandas are popularly cultivated. The wood is soft and used for interior work, including rustic chairs, coffins, matches and matchboxes. The bark of the tree can be used to cure skin diseases. Jacaranda copaia is found from Mexico to Bolivia, and is common in central Panama; the beautiful display of purple is seen well in the dry season from the observation deck at the Canopy Tower. 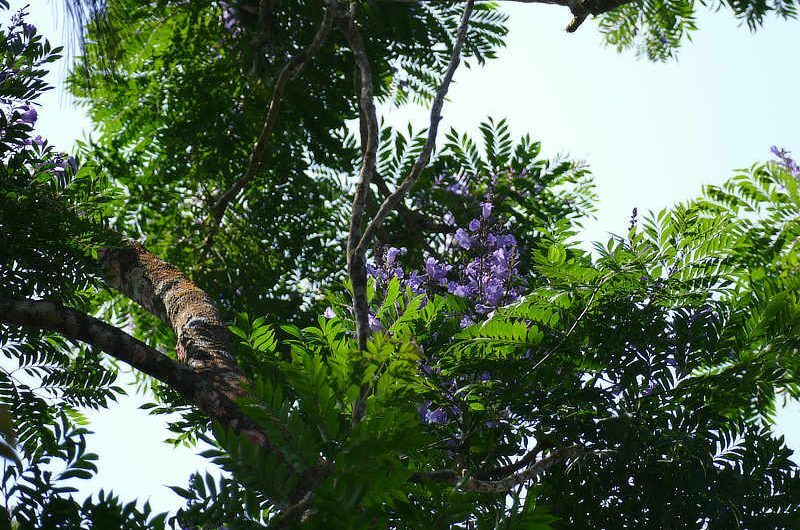 The Jacaranda is a member of the family Bignoniaceae and is also known by many other common names including Nazareno, Palo de Buba, Pata de Elefante and Guabanday in Spanish.